Letter to the Editor: Was this really an opinion? Sun Media has recently published an attack on the Iranian Canadian community in what can only be described as racist, ignorant and the spread of hateful propaganda. 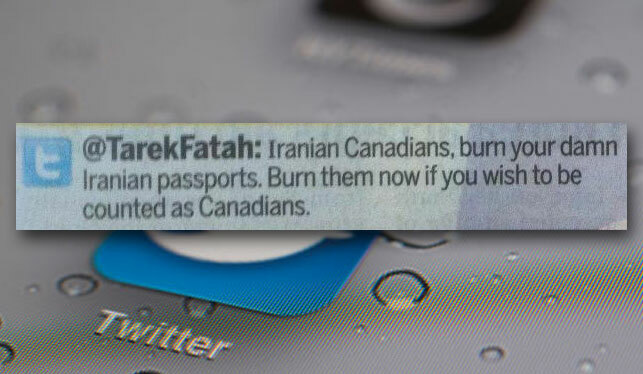 Tarek Fatah, a columnist at Sun Media tweeted: “Iranian-Canadians, burn your damn Iranian passports. Burn them now if you wish to be counted as Canadians.” This tweet to the surprise of many, was published on the front page of the London Free Press — one of Sun Media’s newspapers. Fatah speaks with a hateful sentiment that sets a new criteria for Iranian Canadians in order for them to show their loyalty and be “counted as Canadians” — burning their Iranian passports. To have Tarek Fatah’s tweet, that had sparked controversy on twitter, published on a front page is outrageous. More recently (on September 11th), Fatah in an article titled: “Iran vs. Canada: Whose side are you on?”, launched an unprecedented attack on Iranian Canadians and their concerns regarding visiting family members in Iran, narrowing it to a “vacation and Tehran’s famous baklava.” Fatah completely detaches himself from reality and asks his readers to avoid analyzing the impact of the severing ties between Iran and Canada, but to pick a side instead. This blatant racism demonstrated by a Sun columnist should not find room amongst our community and I ask you to voice your objection to Sun Media and seek removal of Tarek Fatah for his controversial opinions that can be compared to a hate speech. We cannot tolerate that he continue to voice his outrageously hateful opinions through Sun Media’s “news” outlets. Tarek Fatah has not lived up to the ethics and standards we hold in Canada, nor that of Sun Media’s.